Al Lowe, creator of Leisur Suit Larry series. Sierra's logo is in fact a mountain Half Dome that is located in Yosemite national park. Mystery house. Graphics may look ridiculously simple, but when it came out it was nothing was than revolutionary. The same goes with KIng's Quest I. Game series that started it all, King's Quest. Great stories, puzzles, literary references and humor. Another great book, that will give you insight of the gaming history with beautiful pictures. Al Lowe is the creator of the Leisure Suit Larry series. He used to teach music in schools for more than a decade. Eventually he taught himself programming and in early 80s he created three games for Apple II, which were bought by Sierra Online, and the legend was born. He participated in numerous Sierra games, such as King’s Quest III and Police Quest I. But he really made his mark with the Leisure Suit Larry series. A fun fact, Larry Laffer is supposedly based on his coworker Jerry, who used to brag, in a sleazy and dirty way, how many ladies he managed to seduce. Leisure Suit Larry in the Land of the Lounge Lizards was finished in 4 months and quickly became a legend of the gaming world, as did Al Lowe. Al officially retired in 1998 and since then he’s running his humor site Allowe.com. In recent years he was involved in the remake of Larry’s first adventure. The game raised funds through the Kickstarter campaign. They’ve raised $655,000, but reviews were more or less mediocre. 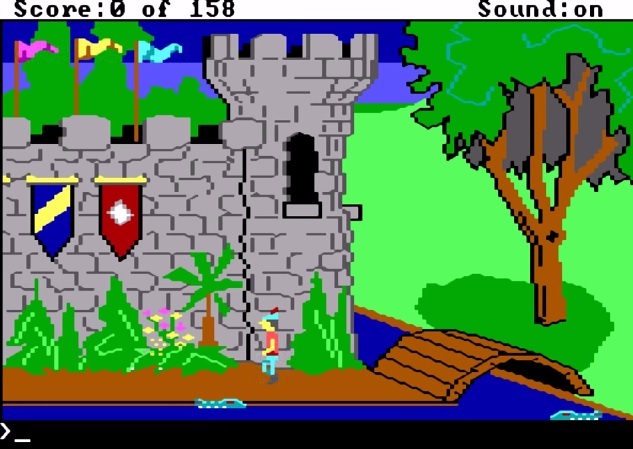 Sierra Online was once one of THE game developers and publishers back in the 80s and early 90s, spitting out adventure games by default. It was founded by Roberta and Ken Williams. Adventure games were one of the game genres of that time. The main reason for that is the computer hardware back then wasn’t advanced enough to support out-of-this-world graphics, so the main focus of every more “serious” game which wanted to have a bigger impact was storyline. Thus simple, text-only adventures emerged, which worked more like an interactive novel than anything else. The first of its kind was Collosal Cave adventure from 1976. While playing it, Roberta had a thought of making a more advanced adventure game with better graphics. She wrote the script and drew the scenes, while her husband Ken, who was a programmer, wrote the code (Apple II). The name of the game was Mystery House and was inspired by Agatha Christie. It became a huge hit. The couple made six more games over the next three years and moved the company to Oakhurst, California. In 1983 IBM contacted them, asking if they would be willing to make a game which would be a showpiece for IBM’s new computer, PC junior. The couple accepted the offer, which spawned King’s Quest I. King’s Quest was a revolution. It cost $100,000 to make and the development stretched to a year. At the beginning it wasn’t a huge success, due to a lack of sales of IBM’s computers, but after they redesigned the thing to DOS and Apple II, sales boomed to the number of 500,000. This achievement raised Sierra to the stars. By 1987 everything Sierra produced reached astronomical success. Space Quest, Police Quest, Leisure Suit Larry series, sequels of King’s quest, all the games achieved great sales and quality. They basically didn’t have much competition until LucasArts published Maniac Mansion, which had some advantage over Sierra games at that time, such as non-typing commands, more playable characters and no dying. Sierra of course stepped up their game and designed a new engine that was capable (among other things of course) of sound card support. Another milestone was King’s Quest V. It cost a million dollars to be made, which had been unheard of. The gameplay itself wasn’t anything revolutionary, but the setting of the game, charm, colors, the protagonist, everything was in its place and worked perfectly together as a whole. Things slowly started to change on the adventure genre scene. In the past Sierra practically had no competition what so ever. In the early 90s, things were a bit different, as adventure games were all over the place. Their biggest competition was of course LucasArts with their flagships Monkey Island and Indiana Jones. Still, Sierra Online was huge in the mid 90s. They started to expand rapidly to other fields, which resulted in the need of fresh capital. So the choice was made. They went public. In 1996 CUC International made a move, offering double price on the stock. What followed? Like in similar cases: reorganization, firing of people and interfering in project development. Sierra as we knew it was gone. Ken and Roberta soon quit and are now enjoying their retirement. Too bad, because if things had gone differently, we would have gotten Leisure Suit Larry in space, named Leisure Suit Larry: Lust for Space. The project was scrapped among many other things. However, we can’t just blame everything on the new owners. Things in gaming world change rapidly every few months and this was the case in adventure gaming. Home computers became more and more capable, 3D games became common and the new generation of gamers didn’t appreciate the old “simple” adventure games. Another thing is that the cost of development became very high, and graphics and design demanded a whole lot of investment money. Adventure games slowly fell into hibernation, where they are still sleeping and waiting for that one new adventure game (the chosen one) that will bring back balance to the force. A new hope is on the horizon. In 2014 the Sierra brand was revived and it was said they will re-release some of their older games. Does that mean we will get to play brand new Leisure Suit Larry games as well as other legendary pieces? Like in all things, only time will tell….